During the SBCS private tour of Monticello; I noticed a Pyramid souvenir building pyramid on a fireplace mantel in the entrance hall. It’s a solid cork scale replica of the Cheops' Great Pyramid at Giza in Egypt. The original was an 1802 gift to Thomas Jefferson from the French writer and Middle Eastern explorer Constantin-Francois de Chasseboeuf, but this one is a reproduction. It seems in the early part of the 18th-19th centuries, there was a European trend for cork models of ancient ruins. 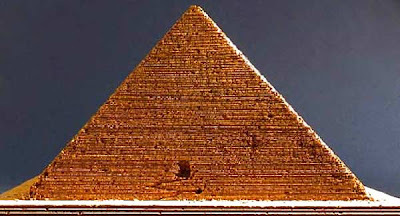 The reproduction of Jefferson’s pyramid replica was constructed in the antique phelloplastik technique revived by German artist and architectural historian Dieter Coellen of Cologne, Germany.Jefferson also designed the Virginia State Capital and adopted the costly practice of commissioning a scale model of the proposed building and turned to the eminent modelmaker Jean-Pierre Fouquet to build the plaster replica. Jefferson was fascinated with everything new, was a voracious scholar and fascinated with Native Americans, dinosaurs and ancient Egypt. It also appears he was an early souvenir building collector.